Having twins is a really amazing and interesting experience. The chance to have two babies at once and watch them grow and develop, reaching the same and differing milestones in their own time is fascinating. There have been times when one twin does something first, such as when Zachary took his first steps and I found myself wondering and worrying about why Zoey wasn't showing any signs of doing the same. Sure enough though, she did a month or so later and now there is no stopping her. She did it all in her own time. Fisher-Price, one of my favourite toy brands for infants and children has launched ‘Discover Your Way’, a celebration of all the wonderful and different ways that children like to play helping them to develop happily at their own natural pace. Fisher-Price® knows that children are happiest developing at their own natural pace, creating products perfectly-designed to feed children’s natural curiosity, encourage exploration, stimulate imagination and facilitate discovery through play, to help babies learn and grow their way. It isn’t simply about reaching traditional developmental milestones. Learning comes through fun, experimentation, natural inquisitiveness. This is why their toys unlock everyday discoveries through play to help your baby develop happily at their own natural pace. It’s these personal moments of discovery that help your baby learn and grow their way. Check out the new Fisher-Price Discover Your Way advert below. 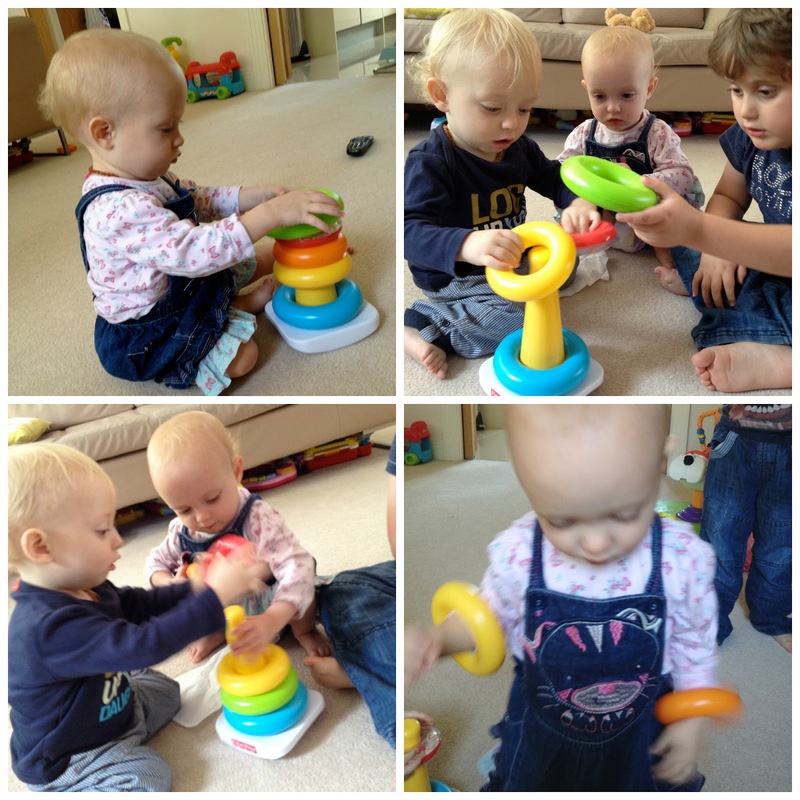 The twins were recently sent two of the iconic Fisher-Price Rock-a-Stack stacking toys which have been so interesting to watch them play with. They both play with the toys so differently, Zoey likes to sit and stack them, she was well impressed with herself when she discovered that the rings can be used as bracelets. Zachary likes to take all the rings off of the stacker as quickly as possible and investigate how he can dismantle the poll from the base before putting it all back together again. When they join forces to play with both the stackers together, I have noticed that they often take turns putting two of each colour together, that is before the inevitable happens and they end up fighting over the same ring despite having two of each. Their big brother, Ben who is 4 years old, balanced one of the rings on his head which the twins found hilarious and they now do too which results in lots of laughter. *Disclaimer: I was sent two Fisher-Price Rock-a-Stack toys for the twins to discover their way with which has been a lot of fun to watch. All views and opinions are my own.